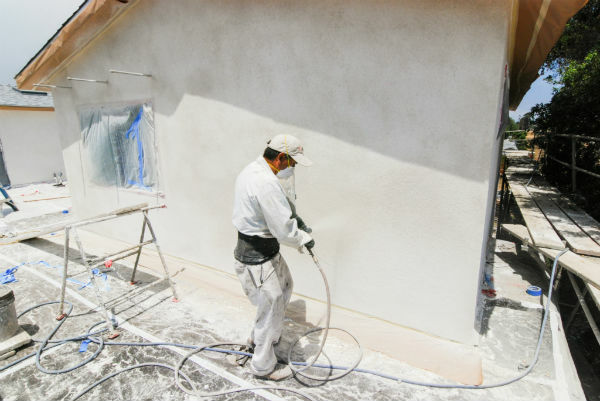 A one coat stucco system consists of paper, foam backing, wire and two coats of exterior stucco. It uses the Styrofoam in place of a “scratch coat” that is typical in a three coat stucco system. It is an alternative to the three coat system and has its advantages and disadvantages. The cement used in the one coat system is about 3/8 of an inch thick and is reinforced with fiberglass particles. So you would essentially still have a substrate of some kind, like plywood, drywall or masonry. Be sure that the substrate as properly installed, so if it happens to be wood, you want to make sure that it is nailed off correctly and there are no nails sticking out of the wall. Next comes the paper. You will have to attach it using a stapler of some kind, either a hand held type or one that roofers typically use. Here is a link to see what I am talking about. You will want to make sure that the paper is secured to the substrate and try to make sure that it is tight to the wall, you don’t want any big bubbles in it. Keep the paper in a roll and roll out a little bit, staple the paper to the wall and keep rolling the paper out, remembering to staple it every foot or so as you go. This takes practice, but is quite simple to do if you use your common sense and remember to overlap the stucco paper by at least 6 inches. Video that has a mini papering tutorial in it @ 3:10 – 9:30. This is the time in the video that shows the paper tutorial, they are lathing a “three coat” stucco application, but the papering process is the same for both applications. Now you are ready to install the foam over the paper. Usually you have to get this particular foam from a stucco supply store in your particular area, as most larger home improvement stores will not carry the right stuff. Cut the foam using a longer type razor knife, you can find these at all of the major home improvement stores. They have longer blades that are retractable and you are able to break off the blade, when needed. Attach the foam using roofing nails that are about 1 and a half inches long, you don’t need to go crazy with the nails, usually four to six will hold the foam in place. Stagger the vertical joints and try to end the foam edges on a stud to minimize cracking. Finally, tape all of the joints where the foam sheets meet, both horizontally and vertically. The next step is to attach the wire to the foam. Typically, 20 gauge wire is used on this type of application, it is a bit thinner than 17 gauge wire and is suitable for the one coat system. Most diy stores, such as Home Depot and Lowes only carry the 17 gauge wire and do not offer the 20 gauge, so you will need to get this from a local stucco supplier. It is much easier for a novice to measure the lengths of wire that are required as opposed to rolling the wire out along the wall, it also saves time and energy to do it this way. Measure the wall and cut enough pieces out so that the wire will go all the way up the wall. You will need to overlap the wire by at least 6 inches to avoid cracks from forming. Be sure you roll the cut lengths of wire into smaller, more manageable rolls that you can actually manage. then go to the center of the wire, pull it up slightly and nail the top of the wire into the closest stud. Work from the center out, in the same fashion, pulling the wire up as you go. Try not to stretch the wire too much, just enough to pull out any bubbles. Now it is time to apply the base coat of cement to the wire. 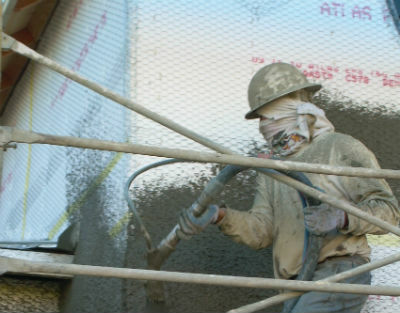 The cement can only be bought from a stucco supply store and is infused with fiberglass material that adds strength to the mix after it dries. All you will need to add is the water and sand accordingly. It is best to use a mortar type mixer, rather than a concrete mixer because the stucco mixture needs to be mixed very thoroughly for several minutes to achieve the correct consistency. The very last thing to do is to apply the finish coat. Make sure you know what type of finish you are going to do before applying, seeing as how different finishes required different application techniques and even materials. 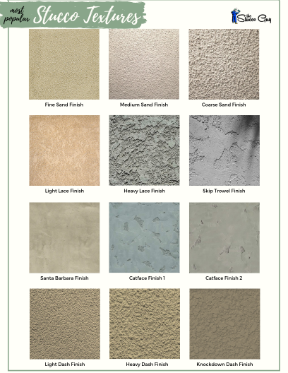 Click here to see various stucco finishes. The procedure is almost identical to applying the base coat, the tools and the application process, but will require different techniques in some cases. This is one of the hardest parts of stucco and is really what the majority of beginners struggle with. It is really something that takes a couple of years to master, but depending on the technique can still turn out quality results by the average person. That was a brief overview on the one coat stucco process. There are too many other variables that could come up, but trying it out for yourself is the best form of learning when it comes to plastering. Be patient and you will get surprising results.